Today's post is one I have been wanting to share for, well, about a year now! I'm anxious to publish it for some reason, but I'm doing it to pay it forward to all the women out there who are carefully listening to countless birth stories, waiting for their own to come. I watched so many birth stories while pregnant and I'm so grateful to everyone who shared their story before me. Not included in the video are my biggest takeaways from the experience of pregnancy and delivery. I plan to read these back to myself if/when I'm preparing for my next labor and delivery experience. Dealing with doctors, nurses, and hospitals can leave you feeling like you're not in the drivers seat and more like you're strapped onto the roof of the car barreling down the highway. The truth of the matter is they work for you. Of course you're paying for their expertise and guidance, but decisions are ultimately yours - even when they aren't presented that way. Do your research, know what you're talking about, and let them know that you're not just along for the ride. In their defense most patients aren't informed and are happy to let them be in control, but that doesn't mean you have to do that! Our Bradley Method instructor made a great point - if you're in the hospital and something needs to be done (like in an emergency situation), they're just going to do it. If they're telling you about it first, that means there is time for you to ask questions and work together to arrive at the best next step for you. This is your time to step up to the plate as a mama bear! It sounds so obvious but something that struck me during one of my many doctor visits during pregnancy was that the doctor only knows as much as you tell them. And even if you told them something before, the chances they actually remember are slim - think how many people they see between your visits! So if you feel like something is not right - speak the heck up. Don't take no for an answer, be that slightly annoying person (all the doctors reading this are cringing), but you know there's truth to "the squeaky wheel gets the grease". Your maternal instincts begin when your baby is still in the womb, it can be a weird feeling at first to go with your gut, but hone those skills as you will need them when your little one arrives and has no way to communicate with you while you're trying to keep him/her alive! And not just so you can get your knees up by your ears ;) Though physical flexibility does come in handy for giving birth, mental and emotional flexibility are a must. Let's face it - your plans fly out the window the second that bundle of joy enters the world, if not sooner. Being flexible applies in so many ways but in this case I'm saying it in reference to your birth plan. I'm a huge advocate for a birth plan. To me it's the first sign to your medical team that you've done your research and know what you'd prefer to happen. But I'm also a huge advocate for knowing that things may not go according to plan. Nothing makes a L&D nurse happier then when you hand them a birth plan while also telling them you know it'll be more of a guide than actual rules (name that movie ;)). Just remember all that matters at the end of the day is that you and your baby are healthy, and you should be prepared to do whatever you have to in order for that to happen, birth plan or not. I'd love to know if you have any big lessons learned from your own experience! Please share them with me in the comments. And without further ado, see the video below for Avery's birth story! If you'd prefer to read over watching the video, scroll down for my loose transcript that I wrote in preparation for filming today's video post. Oh gosh I don't even know where to begin! My sweet baby girl is a year old! 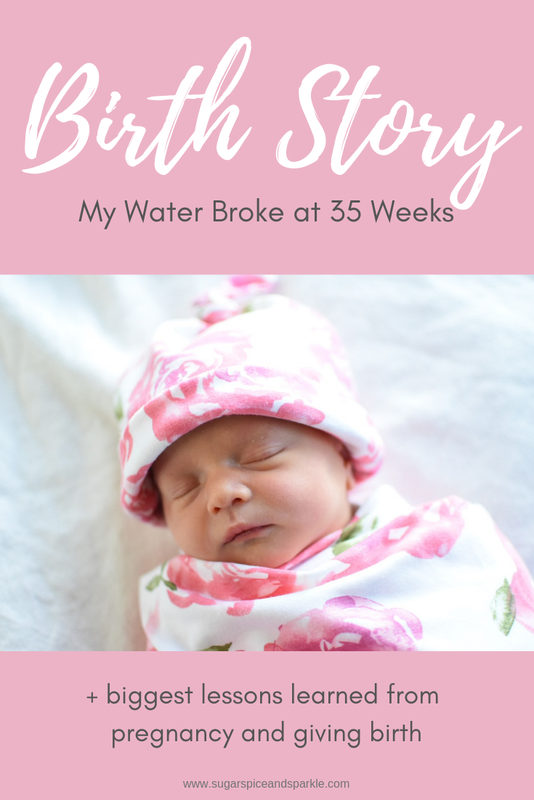 I always wanted to share my birth story because as a first-time pregnant lady I was obsessed with reading every one I could so I could try to figure out what it would be like. Well, let me tell you, nothing will prepare you for giving birth! Don't think for a second that because this happened a year ago this post won't be accurate because I wrote everything down right after she was born. I just never got around to sharing it formally, but her first birthday seemed like a good time to do so. Avery was born on a Monday but the story begins on the Saturday before. My entire pregnancy I was so worried about the end of pregnancy - being huge and miserable and just waiting on baby. My mom had to be induced at over 41 weeks with me so that's where I got the idea from. So I had saved some tasks for January - I'd already be in the post holiday slump plus all the pregnancy stuff so I knew I'd need something to keep me occupied! That Saturday I made a list and told Brian we probably needed to get moving on everything as we were exactly a month out from my due date. So he got going on installing the car seat while I did all her laundry. We finished up organizing her room and went shopping for hospital bag and postpartum necessities. I was so exhausted by the end of the day that I couldn't deal with actually packing the hospital bag, "I'll do it tomorrow" I thought. When we finally laid down in bed it was almost 11 o'clock. When I was preggo I was always so tired so whenever I laid my head down I fell into a deep sleep instantly - it was honestly so weird! Every day I'd wake up like "what year is it?!" haha! So when I woke up an hour later I wasn't sure if I'd slept all night or what was going on - but I quickly realized I was wet and woke Brian up immediately. My water had broken! I called the doctor who said we should make our way in and that if my water in fact had broken (there was no denying it HAD) we would be having a baby. To say the least I was freaked out. Remember I thought I was going to go to 42 weeks - I was currently 35. I was mostly worried about having a premature baby and really scared that she would be okay coming so soon. We both kicked into gear running around the house to pack that dang hospital bag! It was technically "tomorrow" (Sunday) but I never thought I'd be packing it at 1AM! If I had to do it all again knowing what I know now I would have leisurely packed the bag and gone back to sleep. You'll see by the end of the story that there was no hurry to get to the hospital. But as a first time mom who never expected her water to break at all - you just do what you gotta do in the moment. Fast forward to arriving at the hospital, going through triage, and finally getting into a L&D room around 6AM (told you, no rush). I was 1cm dilated and 50% effaced which if you know anything about pregnancy/birth you know that is nothing! There's women walking around at 3cm dilated and 100% effaced for weeks at the end of their pregnancies. I had made the decision about halfway through my pregnancy that I wanted to try natural birth. Brian and I had attended Bradley Method classes for 10 weeks, read all the books, and done all the preparations you can think of. I always planned to be flexible with my birth plan, but my goal was for natural. So when we got to L&D and they said they were starting pitocin we said "hold up". With my water breaking, my doctor said the baby had to be out within 24hrs (this is pretty standard) so we were working against the clock, but they had me on fluids and antibiotics so I wanted to give progressing on my own a go. So we started walking the halls, I wasn't feeling anything still, and after 3 hours I still hadn't progressed. We had to fight them again on the pitocin, which is something the Bradley Method empowered us to do. YOU have the right to YOUR body and YOUR birth plan. Obviously I trusted my doctor but she was never super supportive of my natural birth plan, so I knew I would have to work to achieve it. They agreed to do a cervix softener instead, which was so painful being put in! But it worked quickly and the contractions started shortly after. When it fell out around 4PM, I was at 5cm! I was sooo happy that I was progressing! We were able to have another few hours to see what happened, by this point I was in a LOT of pain. The contractions were really hard and we were using every trick in the book to get through them - standing, squatting, birthing ball, getting in the shower, etc. Brian was such an amazing coach! I wouldn't have gotten through it without him! When it was time to check me again I was still at 5cm. My body just wasn't ready to be in labor despite my water breaking. At that point it had been 22 hours since my water broke and (not counting the 1 hour of sleep we got on Saturday night) almost 48 hours since either of us had slept. With that, there was no getting out of the pitocin. I was devastated, but that's the thing - no matter how much you prepare - you can't control what is going to happen. Being so exhausted, I ultimately went ahead with an epidural. Things kind of shifted from achieving a natural birth to avoiding a c-section, and getting pitocin meant it wasn't a "drug-free" natural birth anyways. I needed some relief from the pain so I could rest before it was time to push. After surviving the epidural (I was terrified!) and getting it to start working on both sides of my body (contractions in half your body are so fun! Not!) I was finally able to rest for a couple hours. When the nurse came back to check on me, I was at 10cm! She was shocked which made us feel shocked too. They called the doctor to come in (poor thing, it was 2AM!) and had me start pushing. When the doctor arrived the whole room changed! There were so many people (they had a neo-natal team on stand-by since she was so early), spotlights on my spread apart legs (again, so fun!) and it was just a whirlwind. I pushed for about 30 minutes and she was here! 3:31AM - after 27 hours of labor and being awake for 51 hours, my baby girl was here and perfectly healthy! Honestly the rest of that day is a bit of a blur for me. It was crazy town of people coming into our room, trying to figure out breastfeeding, and dealing with my own recovery and lack of sleep. My biggest regret is not having a video of it all to remember every little detail, but then again maybe it's best not to clearly remember every detail if you know what I mean! To this day we still are just so thankful that despite being so early she was completely healthy and the only thing we had to deal with was a little jaundice, something full term babies can have. I don't know why my water broke - my doctor doesn't either, she said it can just happen sometimes. If you're thinking my due date could have been off, it definitely was not. I'll give it a week of wiggle room but we were actively trying to get pregnant which meant tracking my cycle to a tee. I knew what the due date would be before I ever went to the doctor when I first found out I was pregnant. I guess some things are just meant to be a mystery! Whatever the reason, I got four extra weeks with my baby instead of having to wait for her while getting larger and more uncomfortable on the daily. A trade I was happy to make!